Flight ALW 301 departed Puerto Plata for a charter flight to Frankfurt via Gander and Berlin at 23:42 LT. At 80 knots on takeoff the captain found out that his air speed indicator (ASI) wasn't working properly. The co-pilot's indicator seemed to work fine. While climbing through 4700 feet the captain's ASI read 350 knots (real speed was about 220 kts); this resulted in an autopilot/autothrottle reaction to increase the pitch-up attitude and a power reduction in order to lower the airspeed. At that time the crew got 'Rudder ratio' and 'Mach airspeed' advisory warnings. Both pilots got confused when the co-pilot stated that his ASI read 200 knots decreasing while getting an excessive speed-warning, followed by a stick shaker warning. This led the pilots to believe that both ASIs were unreliable. Finally realizing that they were losing speed and altitude they disconnected the autopilot. The autopilot, fed by the captain's faulty ASI, had reduced the speed close to the stall speed. Full thrust was then applied. At 23:47:17 an aural GPWS warning sounded. Eight seconds later the aircraft struck the ocean. The incorrect ASI readings were probably caused by the obstruction of the pitot system by mud and/or debris from a small insect that was introduced in the pitot tube during the time the aircraft was on the ground. 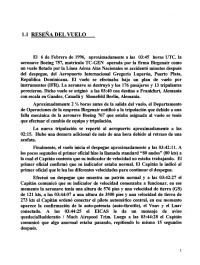 The aircraft was not flown for 20 days before the crash and was returned for service without a verification of the pitot-static system as recommended by Boeing. PROBABLE CAUSE: "The crew's failure to recognize the activation of the stick shaker as a warning of imminent entrance to the stall, and the failure of the crew to execute the procedures for recovery from the onset of loss of control." Investigating agency: DGAC Dom. Rep. Distance from Puerto Plata-La Union International Airport to Gander Airport, NL as the crow flies is 3524 km (2203 miles).